The relationship between a working gun dog and its owner needs to be extremely close. The owner needs to be able to trust the dog to follow the training it has received and the dog needs to trust the owner when entering water or unfamiliar areas that it will not be putting itself in harm’s way. A good working gun dog will save the owner time and leg work, will be efficient and calm and will be able to ignore some very strong instincts in order to perform the task being asked of it. A days shooting can sometimes be long, cold and wet and the dog must remain alert and be ready to follow instructions. Working gun dogs need to enjoy what they do and it’s the enjoyment of pleasing their owners as well as the thrill of the work that makes them such loyal co-workers. 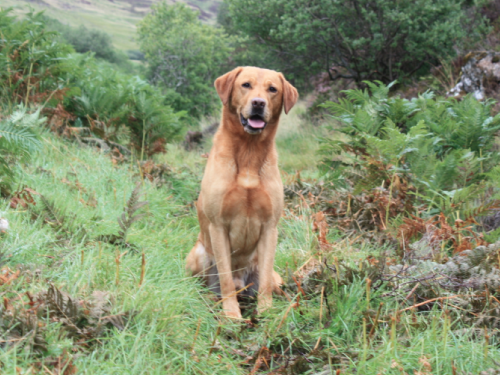 There are a number of things that can help a working gun dog remain at the top of their form. Basic care goes without saying – a good diet, a comfortable place to sleep and regular exercise are vital. A working gun dog can be thought of as one of the athletes of the dog world so treating them as such can help ensure they are always fit to work. You wouldn’t expect a human athlete to get out of the car at an athletic ground assume the start position and run from cold. You would expect them to arrive in plenty of time, jog slowly to start with, do some stretching exercises, do some faster running and sprints – all before they even take off their track suits! Ensure you allow an hour after feeding before asking your dog to work. • Use a dummy or toy to perform some short fetches, gradually increasing the distance you get the dog to retrieve from. • If the weather is very cold or wet, or your dog is working in water, use a coat during periods of rest. • Allow plenty of rest following water retrievals - 10 minutes of swimming uses the same energy as an hour of fast walking so your dog will tire more quickly. Remember :- Muscles work best when they are warm and flexible and are more susceptible to injury when they are cold and stiff. Working gun dogs are often involved in highly strenuous repeated activities which can lead to muscle strains, pain and discomfort. They are trained to develop great levels of stamina and will often continue working despite injury which can lead to further problems as the muscles elsewhere compensate. • Lameness and limping or uneven weight bearing. • General slowing down or less willing to work than before. • Slow to complete tasks. • Unusual movement during walking, trotting or running. More subtle signs may include lip licking when you stroke them, excessive stretching, yawning repeatedly or licking you as you stroke them. Dogs are keen to work and are reluctant to show when they are in pain as in the wild this can mean they become someone else’s dinner. A comfortable dog will be the most efficient, hardworking companion who will not let you down and who will continue to work for you for years to come. As dogs get older they will naturally begin to slow down but with the right care they can continue to work. Using the tips above will help. Sometimes it may be necessary to use pain relief as prescribed by your vet, or look to other methods to ensure your dog’s comfort. Canine massage is very beneficial to working dogs to keep them performing at their best as well as aiding recovery from injury. A good massage therapist will be able to assess your dog’s movement and address any issues as well as making suggestions for how to strengthen any areas of weakness or signpost to other services.